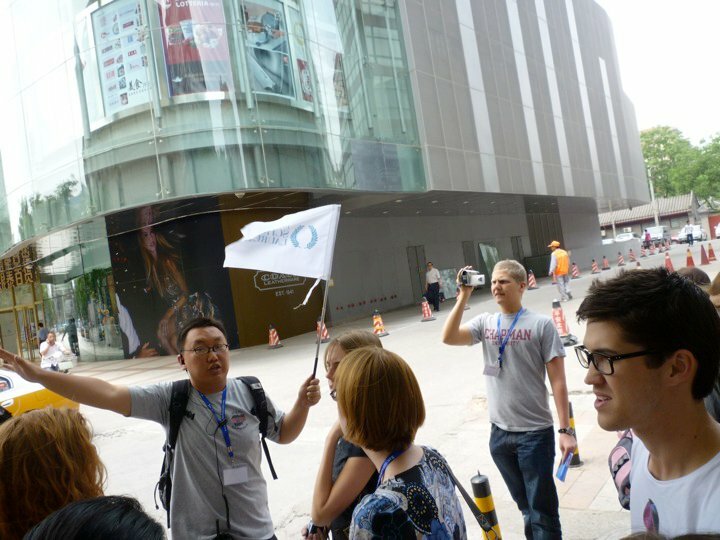 As most of you know, I spent two weeks traipsing through China during the Summer of 2010 with the craziest (and greatest) group of strangers I have ever met. I was nominated through the International Scholarship Laureate Program, and as such traveled on coach buses, stayed in decent hotels, and had tour guides for the majority of my time there. Even with those creature comforts, traveling through Beijing, Hangzhou and Shanghai truly opened my eyes and allowed me to explore and grow in so many ways. As a disclaimer, I went on this trip over six years ago, and many things could have (and probably have) changed since then. These are simply my experiences as I remember them. One of our awesome tour guides! 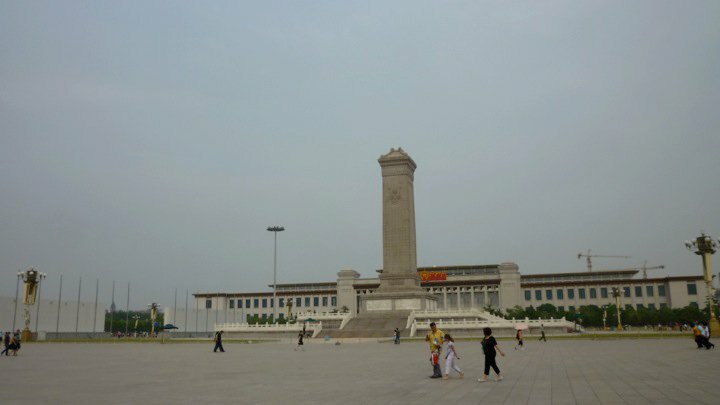 Beijing, Hangzhou and Shanghai are very different cities and unique in their own ways, and each city deserves its own explanation. I first arrived in Beijing extremely jet-lagged, tired and hungry. On our first day, I and a few of the people I had met on the flight over decided to leave our hotel and walk around the neighborhood. I’m a nineties baby, but I instantly felt transported back to the 1980s. Beijing has older buildings, older cars, and the feeling that it hasn’t really grown and expanded in the way other Chinese cities have (of course, this could have changed since 2010). 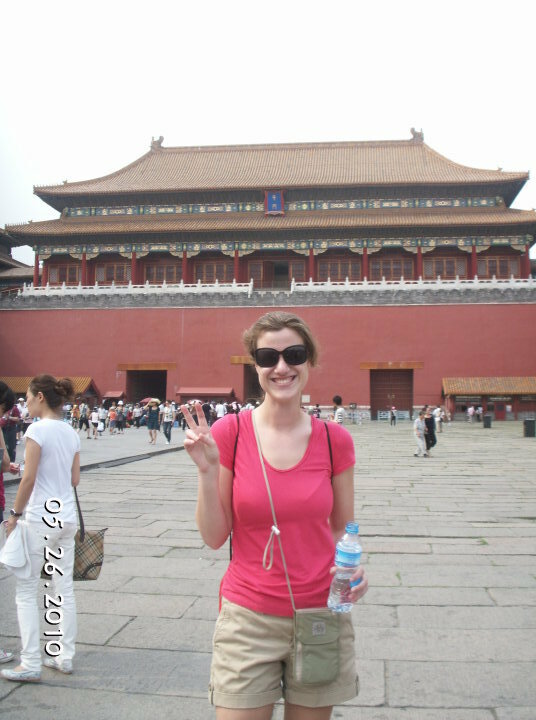 Visiting Tiananmen Square and the Forbidden City was similar to spending time in an alternative universe. For those who don’t know, I am a big history buff, and getting to stand somewhere with such powerful and recent history was awe-inspiring. While in Beijing, we visited the American Chamber of Commerce and were given a crash course on business culture in China, which was really eye-opening and interesting to learn. For example, to hand someone your business card, do so with both hands holding the card and with a slight bow to the receiver. To close a business deal, expect to have meetings and business dinners for months before even considering closing the deal. The one thing I disliked about Beijing was the smog. I would wake up every morning to a thick cloud, which made it look as if it was going to rain. This, of course, was not the case. 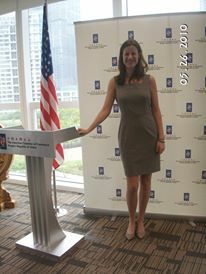 I was also in China during the summer, which consisted of oppressive humidity and heat. Fortunately, our visit to the Beijing Olympic Park was full of trees which allowed the smog to stay away and sunshine to appear. 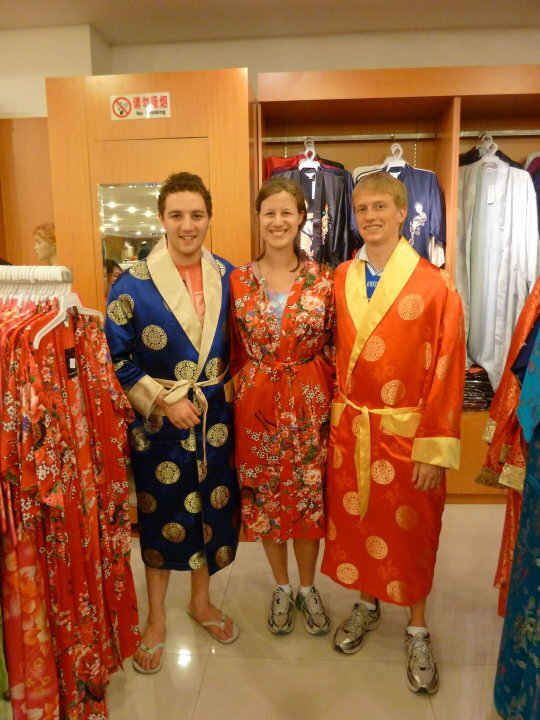 We also took a visit to a silk shop, which was interesting to see the process and gave us the opportunity to try on silk robes! 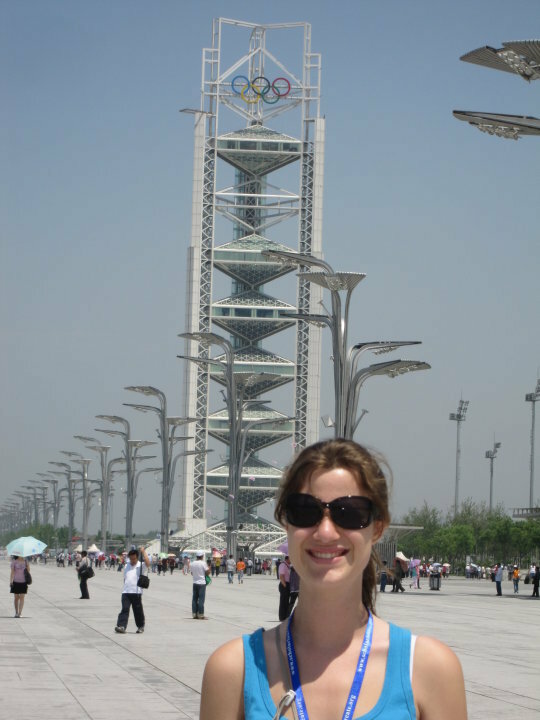 I’m a big fan of Bob Costas – this is where he hosted the 2008 Summer Beijing Olympics! 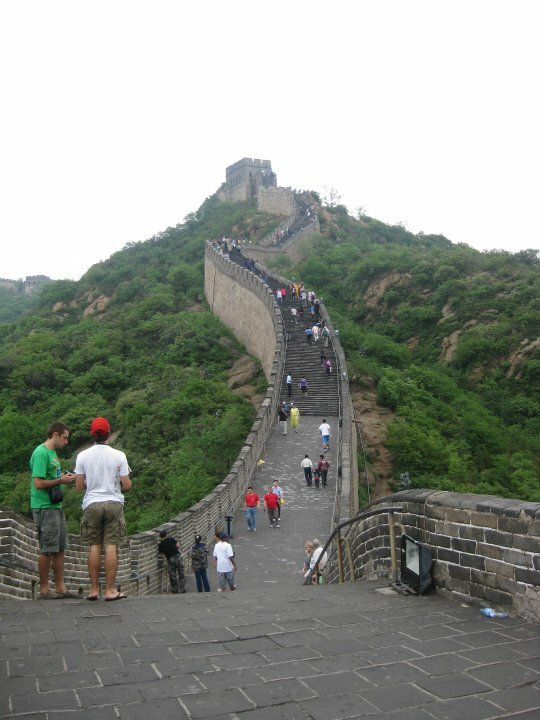 The biggest highlight of the Beijing portion of our trip was visiting The Great Wall of China. This, of course, was also my nightmare because I am terrified of heights (even though I’m 5’10” and an avid skier!). I made it about five steps before I realized I was really, really out of shape. I also noticed how low the walls were and how unsteady the steps were built. 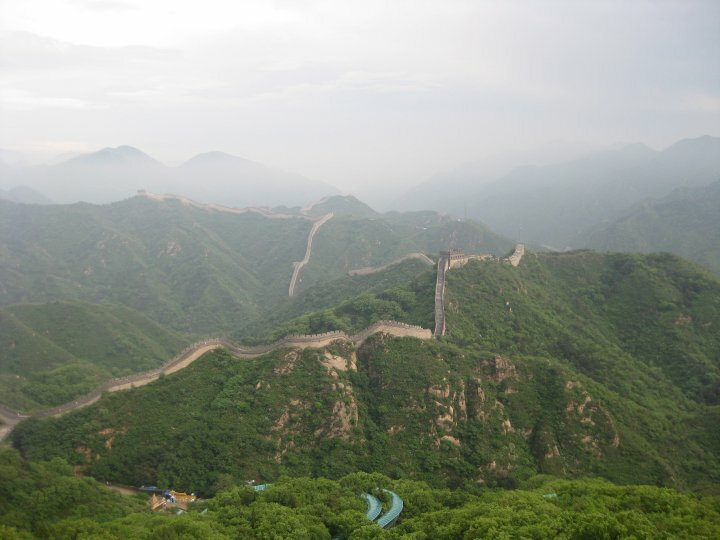 Even so, when we made it to the first tower and I looked out over the mountains in China and saw the wall continue on in the distance, I was struck by a feeling of such calm and peace. It was as if time stood still for just a moment. 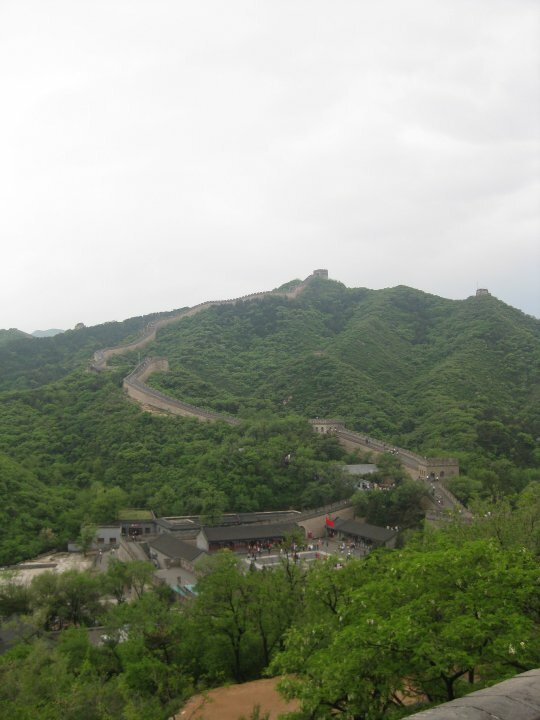 It had never really been my dream to see the Great Wall of China, but standing there and realizing how significant the moment was truly stuck with me. 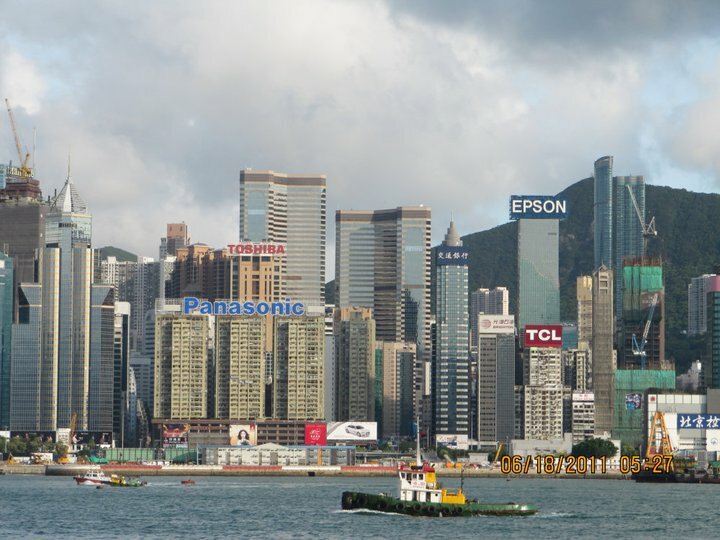 Flying to Beijing from Boston on a fifteen hour flight, alone, was not a highlight of the first leg of this trip, but getting to experience such a diverse country with such a diverse group of people was definitely worth it. I think I gained so much more from this two week business seminar because of the people I traveled with and was able to get to know. 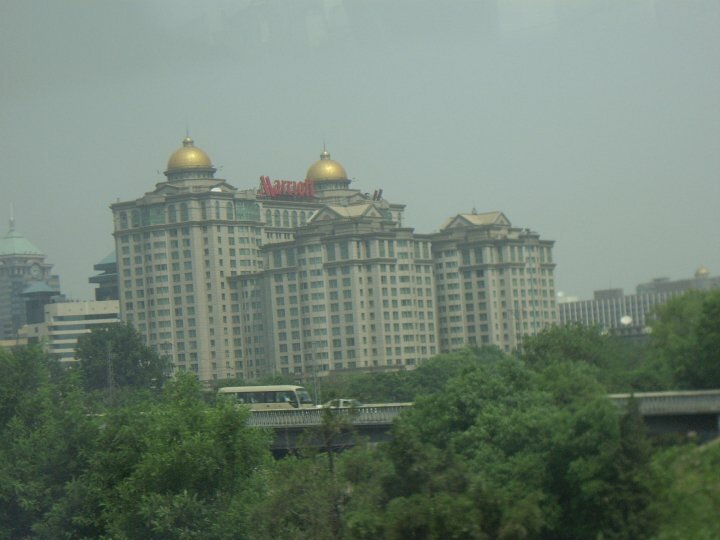 Next, I’ll be telling you all about my time spent in Hangzhou, and why it’s my favorite city in China! I’ll also be sharing my terrifying story of flying within China (which I do NOT recommend!). Stay tuned for more! If you had told me this is what my year was going to look like a year ago I would have laughed in your face. I had big plans and dreams when I started my two businesses last December - make just enough money to travel the world indefinitely. Safe to say that didn’t go according to plan! One business has taken off and one has faltered. I visited one new country (Iceland) but visited a bunch of new cities and some new states (Oregon and Texas). I got involved with my community, made friends around the world, and grew so much. I am so very thankful, blessed and proud of everything that happened in 2018, and am stoked to see what 2019 brings on! When I worked in public accounting, I balked at having to work six or seven days a week, including on weekends. Now that I own my own company, I am constantly working weekends. The big difference? I actually WANT to work on the weekends - I get to solve client issues and problems, dream up big dreams and plan out awesome goals. Plus, when one of the rewards is sunny Southern California, how can you complain!? It’s been a crazy, roller-coaster, awesome year of running my own business, traveling, making friends and experiencing all the new things. As I start to look back on 2018 and towards 2019, the feeling of pride and accomplishment is BIG. ©	2016 by	Jessica Abramson. All rights	reserved.